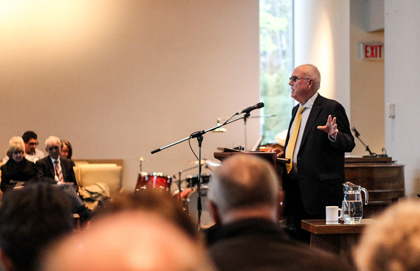 In a lecture at the University of British Columbia this week, Canada’s eminent pollster, Angus Reid, dug deep into the intriguing data from recent polling commissioned by the think tank Cardus. Veteran Canadian pollster Angus Reid used results of recent research to encourage people of faith to exercise good communication skills, link together across the faith spectrum and exercise leadership rooted in hope, when he delivered the Father Henry Carr Lecture in the chapel of St. Mark’s College at the University of British Columbia on May 1. Words like “religion”, “evangelism” and “original sin” tended to be less understood or even misunderstood, Reid added. The basis for the pollster’s lecture was recent research that the non-profit Angus Reid Institute has done in co-operation with Cardus, as part of the Ottawa/Hamilton faith-based think tank’s Faith in Canada 150 project. Details on the results of that research is accessible at www.angusreid.org, under the heading of: A spectrum of spirituality: Canadians keep the faith to varying degrees, but few reject it entirely. Testing the implications of having a faith – not in the next life but in this life – touching on such matters as the influence of faith on family life, a sense of morality and the nation’s social and political fabric. He told close to 200 lecture attenders at the Catholic college that among the many words used by both believers and non-believers to delineate religious ideas, the terms “forgiveness” and “mercy” found much warm resonance among people drawn to faith. Attempting to determine possible transformative patterns of belief and faith in Canada in decades to come. He explained that the research commissioned by Cardus was based on surveys of 2,000 Canadians, led by institute executive director Sachi Kurl. Over 80 per cent of those surveyed had some relationship to Christian roots. The remainder’s connections were with other world religions. The ratio approximates reported Canadian breakdowns. Do you think there is an active God prepared to listen to you so the act of prayer has some meaning? Do you spend any time reading the Bible or another sacred text? Do you have an experience of God’s presence? What is the likelihood that you would desire your children to have an education in your faith? Do you yourself attend religious services? The religiously committed. This group represented 20 per cent of the population – one person in five. On the Prairies and in the Atlantic provinces they represented a higher percentage. About 10 per cent more women than men fell into this category. Religiously committed people answers all seven of the questions in the positive. And committed people were usually not uncomfortable around other faith groups, but found their least comfort level with atheists. Twice as many committed people were to be found among first generation immigrants or members of visible minorities. The spiritually uncertain also represent 30 per cent of the population. “They only answer to belief in God,” and they are “the most curious about death and the meaning in life. Their biggest concern: Is this all there is?” The highest percentage of the spiritually uncertain are in Quebec. The non-believers represent 20 per cent of Canadians on average but much more heavily populate British Columbia – close to 50 per cent. Noted Reid: “They say ‘no’ to all seven questions, are uncomfortable with people of faith and are liberal on matters of sexuality, transgender etc.” He noted, in an aside, that non-believers tended to oppose genetically modified foods but were all right with genetically-modified babies. 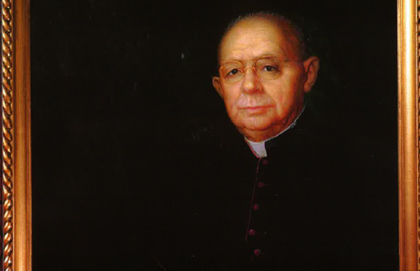 On a personal level, Reid paid tribute to Father Carr, a Basilian who played major roles in Catholic higher education in Ontario, the Prairies and British Columbia during a large part of the 20th century. He told how a 19-year-old woman studied ethics and philosophy under Carr and went on to be a devout Catholic, a mother of seven and a very smart person. “And that woman was my mother,” Reid noted. Lloyd Mackey is a leading writer on religious faith in Canada, and senior editorial advisor to Faith in Canada 150’s Thread of 1000 Stories. Featured image taken by Sara Scali, St. Mark’s College.